I first met Toby Moore on Thursday 28th June at Helen Packham’s fabulous event ‘Entrepreneurial Leaders Live’ in Brighton. I was very lucky to have been chosen to talk at Helen’s first ever live event and what a day we had. I told my story and was totally inspired by all the other speakers that day, one of which was Toby. I must just let you know that Toby is the curator for TEDx Brighton which is one of the largest TEDx events in Europe. 1500 people go to see the TEDx talks at the Brighton Dome so it is a pretty amazing event. At Helen’s event he had mentioned that he had loved my talk and it had resonated with him – which was a huge compliment. We connected on social media and the next time I saw him was on a day workshop about speaking down in Brighton in September. I felt really deflated that day as I just didn’t believe I would be able to do this speaking thing – strange as one of my sayings is ‘there is no such word as can’t’, the legacy my dear Dad had left me. I just didn’t feel I had good energy when I was speaking and I certainly didn’t believe that my story was anything special. I’ve since learned that everyone has a story and they are all special and very often extremely inspiring. I just a bad day at the office I guess. I bought a ticket for TEDx Brighton because I really felt it would be good to watch the speakers and see if I could learn even more about speaking as it was still something I was passionate about doing. 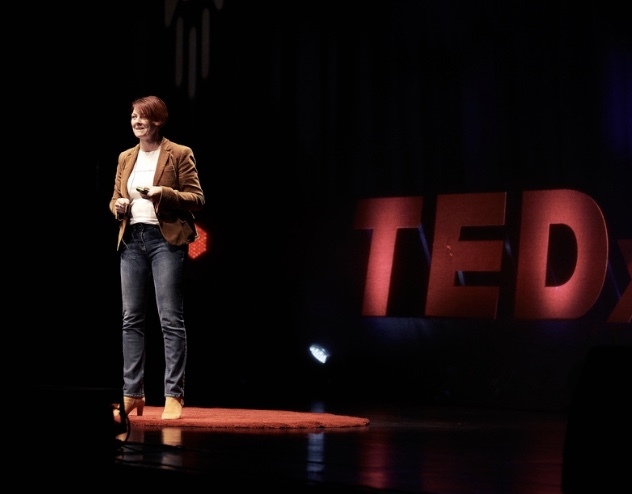 I had never had the TEDx experience and I knew it was an aspiration of mine to one day have a TEDx talk of my own – how amazing would that be! My first message back was – ‘are you serious..?! !’ And of course he was – ‘Super serious’, he said! And so my TEDx adventure started. I had 7 days to prepare my talk. My talk was 14 minutes. Out of those 7 days I was recording my audiobook and working with clients for 3 days back to back. So really I had about 2 days to prepare my talk and then Toby messaged to say, if you can get down on the day before that would be great as we have rehearsals…! That week I travelled down from Milton Keynes on the Wednesday evening, a 2 hour journey, to stay with my friend in Tunbridge Wells, and on the Thursday morning I drove to Brighton and settled in for two of the most amazing days of my life. What a fantastic experience. Our theme was ‘Adventures and Journeys’ and I found myself amongst the most inspirational people. I felt a complete fraud. How could my story possibly be interesting amongst these wonderful tales of adventure, survival and bravery? Adventurers who had climbed Everest, a guy who was part of the WWF who spoke about polar bears, a blind footballer who played for England, A young man who was just 16 that day! and incredibly inspiring, who showed a video he had made of a homeless man in Brighton, speakers who had all been on wonderful journeys, and had great stories. Sophie Cook who talked about being suicidal every day because she was born as a man and was always a woman, such a touching story. She became the first transgender woman to work in football’s Premier League as club photographer for AFC Bournemouth following her transition from Steve to Sophie in the summer of 2015. I am proud to call her my friend. Kittie Kipper – Marine plastic is killing our planet and our wildlife. Kittie’s artwork is 100% made of waste found while cleaning British beaches. She is totally dedicated to the cause when it comes to educating us about plastics and the huge impact they have on our planet, and what we can do about it. Ben Clench who literally took my breath away with his tragic story. He went to visit his girlfriend in Haiti, where they were involved in traffic accident. Ben’s girlfriend was killed and he was left with a brain injury and pretty much told he wouldn’t be able to do very much at all if he even survived. He has since done a Masters, been to Glastonbury and stood on the Brighton stage that day and delivered an amazing TEDx talk. I felt so very proud of him. And more – 17 of us in total. That day I made friends for life, because we shared such a wonderful connection and experience together – we were a team. All supporting and cheering each other on. I had the last slot before lunch and thought that everyone would be so tired and hungry that it would be a graveyard shift! I couldn’t have been more wrong. Toby had said that the TEDx audience was a special one and he was absolutely spot on. From the moment I walked on the stage I realised I couldn’t actually see the audience at all – all I could see was bright lights. Some may think this was going to make it easier, but I am a very visual person and I love to connect to my audience – especially with eye contact. This wasn’t going to be possible, but I noticed something really special. My hearing was enhanced and as I started to talk and tell my story, not only did they laugh with me, and at times cheer me! I could also hear at times intakes of breath as I told them about my journey. What a wonderful connection and what strength and confidence I got from these amazing 1500 people, who I felt really wanted to know about me and how my story would all end. It was a truly inspiring day and I felt very proud that I managed to produce and deliver a talk in such a short timescale – and am secretly glad that I was under that pressure – it clearly works for me. I only had 2 weeks when I was on Dragons’ Den! If I had the chance to do it all again…yes absolutely I would, and now the video is out I am enjoying wonderful messages from complete strangers who have been inspired by my story, and before the video even came out I had two bookings for speaking events which I am very excited about this summer. If you have a dream to do a TEDx talk then just do it. You will have done something very special and it will be something that will truly help you to grow and become an even better version of you. Please like and comments share any of the talks as this will help us to inspire the world.